Something different for you today – more Penny Black cards! lol I don’t think I will ever tire of creating of creating with these gorgeous images. First up today is my attempt at a CAS card. It’s a one layer card and I rarely make them so it still feels a little unfinished but I forced myself to walk away. lol I did have to make this card twice. The first time I added some of my own handwriting and it looked a little…not good. lol I also somehow managed to sponge blue across the poor little hedgehog’s face – he looked a little unwell. Poor thing! Materials used: Stamps – Paint the Town, Salutations (Penny Black); Distress Ink, Copic Markers, and Wink of Stella. The idea for my second card came about when I was thinking how cute it would be to have the hedgehog lying on a hill, or in a big field of green grass and flowers. I think it would also be super cute if the hedgehog was lying in a bed of autumn leaves. I really wish I had popped the sentiment but aside from that I totally love this card. Materials used: Stamps – Paint the Town (Penny Black), #Awesome, Scripty Sayings (Lawn Fawn); Distress Ink, Copic Markers, Die – Die-namics Blueprints 8 (My Favourite Things) and Wink of Stella. I thought I’d finish of my post by sharing a little bit of the aftermath of creating the above cards. I’d also like to challenge YOU to post a photo of your space after a craft session. Awww….I don’t think he looks unwell at all! Love both of your cards, Kylie – thanks for sharing! 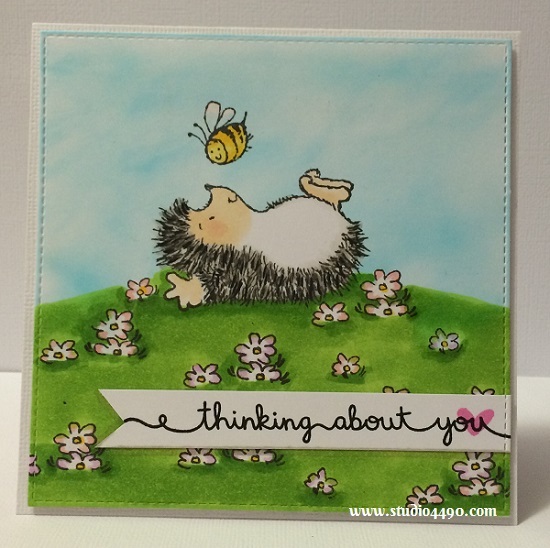 Kylie, I too am a Penny Black stamp fan, and I think the hedgehog images are such fun! I just loved your cards. They made me smile. What a cute and sweet card, Kylie!!! A great design! Have a wonderful Sunday!!!! Kylie…here I am, running late and having a grrr…about all the internet shenanigans going on! I ‘think’ some may be resolved…we shall see! Your duo of hedgehoggy cuteness are pure delights! Love the CAS of the first one (sometimes ‘walking away’ is the biggest challenge) and the second with the ‘full-on’ hill of flowers is absolutely darling! You’re working magic with this little dude and his bee friend! Sweet and heart-warming! 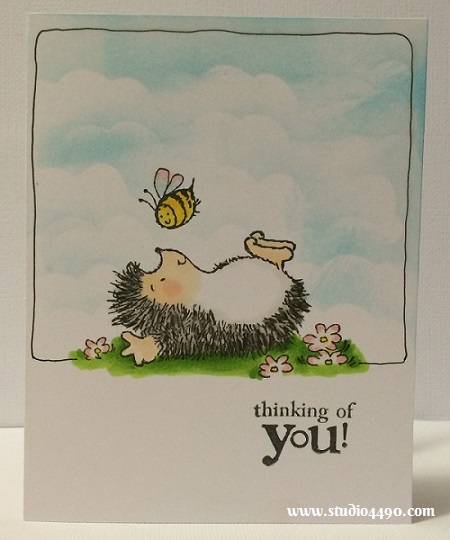 Perfect thinking of you cards…perfect! Oh C, those internet shenanigans are painful and they need to leave you be jow! Thank you for the lovely compliment too. 🙂 Walking away can be so hard. big hugs! Too sweet, Kyle. I just adore that hand-drawn frame! It fits the whimsical stamp style just perfectly. My work space doesn’t look so bad after crafting. I’ve gotten into the habit of putting things away right after I use them – which also gives me the opportunity to move around a bit and think about the next step on the card. 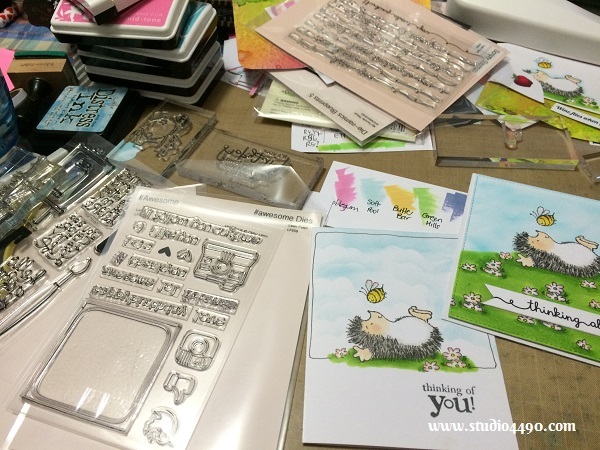 Now showing my die-cutting area after a few cards…. that’s a big mess! Perfect CAS card and sweet little hedgie on a hill!! Your first card is wonderful. The doodled frame finishes it just right! It’s darling. Love your second card too!! Both are colored perfectly, as per your usual my dear friend! Don’t think I’ll have any desk photos for the next few days. Right now, 3 of the grand-girls are upstairs sleeping, but we have two full days of fun and frolic ahead of us. And I’m sanding and painting an old office-type credenza to put in my craft room. Maybe I’ll take some “before & after” photos of that to show…Anyway, no craft time for me for a bit. But I definitely want to see more cards from you!! These are fantastic! Love ’em!! Thanks so much, Bev! Feel pretty happy with them too. Oh sounds like you are in for a very busy and fun couple of days! Would love to see the credenza if/when you have time. I’ll try and create while you are unable to do so. 🙂 hugs!